We pretty much love anything with green tea in it, so adding it to a smoothie just made sense! This tasty blend of green tea, blueberries and agave nectar was just the right amount of sweet while enjoying some power packed nutrients. Our blender isn't the best so you will see larger pieces of blueberry and it kind of turned out more like a slushie. Even if you don't have a top of the line blender mixing this up will still be a treat. Boil water and add in the 2 green tea bags. You can brew your tea the night before to save time in the morning or you will need to wait until the tea cools off to blend it. You can also add the green tea to an ice cube tray and put the blueberries in it to freeze them and then blend together, but we weren't patient enough for that. 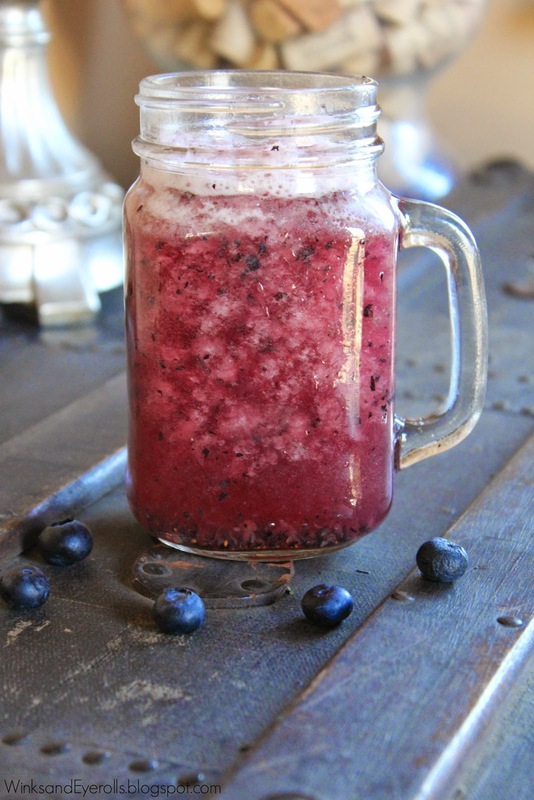 We added our tea to the blender, added in the blueberries, ice cubes, and agave nectar. Blended them together and then poured and enjoyed.